To the Romans, palm leaves were a symbol of victory and of military prowess. The Jews who greeted their Messiah were simply echoing this practice, perhaps drawing on 1 Maccabees where it is recorded that the people waved palm branches to celebrate the independence of Jerusalem and Judæa. The One who was lain in a manger? The person who humbles himself will be exalted. The humility of God in human form is expressive of the humility of God in Himself, and we are made in His image: ‘Christ liveth in me; and the life which I now live in the flesh, I live by the faith of the Son of God, who loved me, and gave himself for me’ (Phil 1:21); ‘For to me to live is Christ, and to die is gain‘ (2Tim 1:12). To make your own righteousness out of holiness, godliness, grace, religion, experience, and even of faith itself, is as legalistic and inconsistent with the New Covenant as it is to make righteousness of holy works. We can see but a little way into the nature of the soul and the depths of man’s heart. Today is a day for humility; for reflecting on the fact that Jesus did not enter Jerusalem riding a fine chariot, or the Hebrew equivalent of an armoured Cadillac or Rolls Royce. 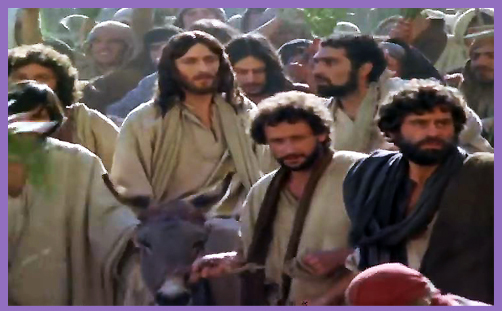 He rode in on a donkey, like a humble peasant on a quiet mission of peace. And these people who today shout “Hosanna!” no doubt include some of those who will soon cry “Crucify him!”. And all because they realised that the Jesus who rode in on a donkey was not the Jesus they had invented in their minds, for He had thoughts, plans and purposes which were not remotely in line with their own.